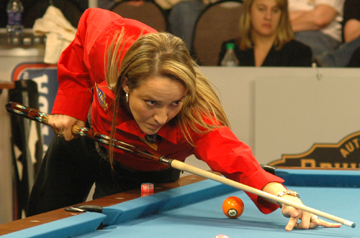 Villarreal is a 15-time titlist on the women's pro tour, and a perennial Top 10 player. She's known best for her extroverted playing style - dancing and chatting up the crowd during matches - and for her go-for-broke shotmaking. What advice do you have for players who aspire to be pros? If you want to be a professional pool player, you have to love the sport, you have to learn to travel, and you have to love to practice. And if they can dedicate themselves to practice, I would say to challenge people who are better than you, not somebody who's weaker than you. Challenge people and see what they do, and watch tapes, and then learn from there. You have to love the sport, it's just like any athlete - golf or whatever - you have to love what you do. And all the dedication - look at the dedication of Michael Jordan and Tiger, and look where they are. … I still have that. And that's what I'm saying, if I knew I could go out there and win all the time, I'd be bored. It's so challenging. I think that you can be taught to be a great pool player, but you have to have it. You have to have it. Just like any athlete, you just have to have it. Look at LeBron James. I mean, he's unbelievable. You can tell he's gifted. Either you have it or you don't have it. Just like my teacher came up to me and said, "You can be a world champion. You have an incredible stroke." And I didn't believe him, but I came back a year later and went from unranked to number one in the world in 12 or 13 months. Do you always think you can make a shot, no matter how difficult? Sometimes I go for it when maybe I should play safe. It's because I have no fear, and I'm considered one of the best shotmakers in the world with the women. And I know, just like Allison Fisher and Karen Corr say, when I come out like a train they can't stop me. There are times I know no matter how difficult the shot is, I can make it. As long as I know I can get shape on the next ball. But there is a couple of times you just have a brain fart and are like, "God, why didn't I play safe?" You know what I'm saying? And we all do it. People have come up to me and said, "Why did you do that?" and I was like, "Oh my god, I never saw that." Where does your animated playing style come from? I say what I feel. That's how I am. On the table, off the table, it's just my personality. Everybody says, "I love it Viv, because I don't even know pool but when you say something we feel what you're saying." And so many people tell me that. "You let us know what you're feeling." So I'll it out loud: "How can I miss this easy shot, how can do this." And sometimes, I just say it out loud. It has nothing to do with gamesmanship. I wouldn't disrespect anybody. Everybody knows me - when I talk, it's what I'm feeling inside. It's like when I missed that easy 8 ball, and I said, "Oh my god, my mother could have made that." But that's exactly what I'm thinking. It has nothing to do with the girls. They are used to me, they're used to how I am. So I don't do any of that to shark anybody. Some of the girls are starting to talk now. Allison talks to me more. But that's basically me. Efren Reyes is my hero in pool. In any other sports, I love Tiger Woods for all that he's accomplished, and Michael Jordan. Nobody can do what Efren can do - that's why he's called the Magician. He's just incredible. We're good friends, but I've never played him. He's just like my hero. I always tell him that, "Here comes my hero." be one of the greatest players in the world, and to do things on the table that no one else can execute is remarkable. And it's true, because there a lot of people who are like, "How in the hell did he do that?" What's the best advice you've ever received for playing? Always stay in rhythm. Always walk around the table the same, always stroke the same, basically. The best advice in life: No matter what happens to you in life, everything happens for a reason, and God has his path for you. You love to dance. What music do you listen to? I listen to all kinds of music. I love Beyonce, Madonna. I love R&B. I love all kinds of music. I just don't like hard rock and heavy metal. On my iPod, I always listen to Barry White, "Can't Get Enough of Your Love, Babe." Always, always. Every match. That song. I love that song. They caught me one time on ESPN, I was just like "Ehh, just can't get enough …" And they said, "This is what Vivian listens to." I don't know what it is - the beat, the words, just everything. I don't know, it just puts me in a great mood. What are your best memories of pool? There are two moments that I always remember. The first was when I became number one in the world in Chicago in 1992. I went from unranked to number one in the world. … And then there's when I played Allison Fisher and won the ESPN World Open Championship for $60,000 in 1996. She hung the 9 ball, and I beat her 7-5. I'll never forget it. I got up - I didn't even chalk my pool cue. I was so freaked out I just made it. Everyone was like, "You're gonna scratch!" Give us some tips we wouldn't expect. I gambled way back when. I mean, that's why I played so well. Because with the men, I'd play $20, $40 sets just to play, because I knew if they were playing for nothing, they wouldn't give it their all.You have to have down time. I watch movies, play suduko. Like when I'm home, I'm with my family. I love my mom. I'm an only child, so I'm really close to my family, and I'm always doing something around the house. Cutting my yard, doing this, doing that. That's my down time. I'm always doing something, always doing something. Playing with my little cousins, my godsons. All of that is so rewarding to me, because I get to spend time with them and see them grow up, so that's my down time. What would you be doing if you weren't a pool player? Finish this sentence: "Pool is like life because …"
Pool is like life, because nothing is easy. Before I die, I just want to live my life to the fullest. Just to make sure I was living my life and knowing I'd done everything I wanted to do. Well no, I take that back. All I wanted to do before I died was see Natalie, and I got my wish.